Dublin, Ireland (CNN) -- John Kelly was 14 years old when, he says, he lost his faith in God. "I was taken down these stairs. I only had a nightdress on. It was pulled over my head. I was left naked. This 6-foot, 4-inch [tall] religious brother stood on my hands... and another guy had a whip that we made ourselves, with coins in it. And he would run from a distance to flog me," Kelly remembers. Kelly, now 59, spent much of his childhood living in institutions run by Catholic orders in Ireland. The abuse he remembers most vividly took place at a reformatory in Daingean, in central Ireland. "It was a very significant night for me," he says. "I'd been raped and buggered previously by these religious brothers, and I'd been physically beaten and psychologically tortured for months -- I spent two years in the place." But Kelly reached a breaking point as one Catholic brother held him down, another whipped him and two others looked on, he says. John Kelly says he was abused as a teen living at a reformatory run by a Catholic order in Ireland. "I begged God to take me away. I just wanted to die to get away from the pain. And God wasn't there for me," he says. Kelly's "crime" that night, he says, was to have been named by another boy at the reformatory, falsely, as an accomplice in a plot to escape. But Kelly did manage to escape from Daingean soon after, and spent more than 30 years in London before returning to Ireland. Now he is campaigning on behalf of victims of child abuse. Those victims number in the thousands -- possibly tens of thousands -- three major investigations in the past five years suggest. The most recent, the Murphy Report, found the Archdiocese of Dublin and other Catholic Church authorities in Ireland covered up child abuse by priests from 1975 to 2004. Child sexual abuse was widespread then, the report found. Liam McGlynn, a retired public official, thinks that it was no accident that so many child abusers found their way into the priesthood in Ireland. The prevalence of the problem, he says, suggests that there were "people who were aware that the best place to abuse children was under the cover of the church. What better cover could you hope for?" He emphasizes that that's only his personal opinion, but he observes that an entire generation has been turned off by the scandal. "Virtually no young people go to church. The main churchgoers would be my generation, still, and older," says McGlynn, who is 57. "The church has lost an entire generation." "I haven't been to church for quite some time. My faith has been seriously damaged," he adds. He's part of a much broader trend, says Patsy McGarry, religious affairs correspondent for the Irish Times newspaper. More than 90 percent of Irish people attended mass at least once a week in the 1970s. Today the figure is about half that, he says. "The church has lost working-class urban Ireland," he says. The faithful were shocked and disgusted to learn that Irish bishops had covered up abuse in the name of protecting the church and its priests, he says. For loyal Catholics, the most disappointing revelation, McGarry says, was "to have it exposed that bishops behaved in contravention of canon [church] law -- as was the case -- in contravention of civil law -- as was the case -- but also, and above all, in contravention of moral law. It blew them out of the water." He saw proof of the change in attitude towards the Catholic Church just this week, he says, when he went to a St. Patrick's Day parade in his hometown in rural Ireland. "There were two bishops, a retired one and his successor, and there was none of the deference [shown to them] that would have been there when I was growing up in that same small town. Deference to bishops has practically disappeared in Ireland," he says. That's a very fundamental shift, he observes. Once, bishops "had a unique status in Ireland, far higher than any government minister," McGarry says. "The bishop was a supreme being. ... He had an unequaled and unchallenged status in Ireland," he says. "It'll be quite some time" before the church regains its moral authority in Ireland, McGarry predicts. "I mean, this is a deeply damaged institution because its behavior has been exposed as immoral." But the church will survive in some form, he says. "If you're asking me, is this the end of Roman Catholicism in Ireland, it is not. What it is, is the end of a form of the Roman Catholic Church we've had in Ireland for about 150 years," he says. From now on, the church will need to involve more women and more lay people, as opposed to clergy, in running its affairs, both as a response to the crisis and as a simple matter of demographics, given that a generation has turned its back on the church, McGarry says. Pope Benedict XVI is due to intervene in the crisis within days. He is expected to release his official statement on the abuse scandal Saturday, in the form of a pastoral letter to the Irish faithful. 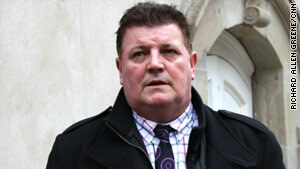 Abuse victim John Kelly says the statement will need to be far-reaching indeed to satisfy him. "We need him to say that he will get rid of all bishops and cardinals who were involved in the cover-up of the abuse of children and start again," he says. "If it means all the bishops and cardinals have to go from Ireland, so be it," he says. "Ireland would be a better place for it, and the church would certainly be a better place for it." Journalist Bridget Fallon in Dublin contributed to this report.